I immediately began my exploration of this stunning new CD of music by Peter Racine Fricker with the Adagio and Scherzo. These two pieces were composed during the summer of 1943, when the composer was in the Royal Air Force, working as a radio operator. During that year Fricker married (Audrey) Helen Clench, before being posted to India as an Intelligence Officer, having recently participated in an ‘intensive course’ learning Japanese. Interestingly, the Adagio and Scherzo are not listed in the University of California, Santa Barbara, California catalogue of the composer’s music. Neither do they appear in the current Grove’s list of works. The liner notes, by Christopher Husted, suggest that they may be the central movements of a projected string quartet (String Quartet No.0!). At any rate, these two pieces ‘remain the most thoroughly developed work from this time.’ Fricker’s ‘official Op.1’ are the Three Preludes for piano composed between 1941-4. The Adagio and Scherzo are immediately approachable and reflect the modernism of the day, with just a hint of something undefinably ‘English’ in mood. The sound world of the two movements alerts the listener to the foundation of Fricker’s style. He was not an adherent to the hegemony of Ralph Vaughan Williams or William Walton. His mentors were Berg, Hindemith, Bartók and Schoenberg. The basic premise of his style was a free use of atonality rather than rigid serialism. Typically, this would be his compositional style for much of his career. For my review of Fricker’s String Quartets, I rely heavily on the excellent liner notes by Christopher Husted. Little has been written about the composer and his music: an ‘official’ biography is a desideratum for listeners and students of 20th century British music. There seems little doubt that Michael Tippett’s corpus of string quartets inspired Fricker. Tippett had composed his second and third essays in this form during the war years, whilst working at Morley College. He had extensively revised the First Quartet in 1943 (originally composed in 1935). At the same time, Fricker’s teacher Mátyás Seiber had published a major study of the six Bartók quartets, and also began work on his own Quartetto Lirico during 1948. As Husted suggests, ‘These alone would pose example enough to any young composer; that the quartet was a traditional medium for speculation, experiment, and demonstration of skill could only have made it more attractive.’ Unmentioned in the liner notes is another source of inspiration for the String Quartet No.1: Francis Routh (Contemporary British Music, 1972) explains that it ‘resulted from sketches he made after seeing an exhibition in Battersea Park of the work of Henry Moore.’ Work on the Quartet No.1 began in 1948, and the completed work was submitted for the Edwin Evans Prize. The competition was won by Elizabeth Maconchy’s String Quartet No.5 (1948): Fricker was given an honourable mention. Fricker’s quartet was premiered on 6 September 1949 at the Salle Erard on Great Marlborough Street, London. The Quartet is composed in a single movement, but incorporating elements of the less traditional slow-fast-slow design. The harmonic language seems to hover between tonality and atonality. The Times (9 June 1953) made clear that this was Fricker’s first work ‘in this medium that made his creative qualities fully clear, proclaiming him something more than a promising and talented, but possibly flash-in-the-pan composer.’ Alan Frank was correct, when he insisted that this Quartet ‘showed purpose, consistency of style, and skill in exposing its ideas.’ The String Quartet No.1 was dedicated to Mátyás Seiber. The String Quartet No.2 was written for the Amadeus Quartet during 1953. This work is less austere than the previous example. The music is simultaneously lyrical and dramatic, and exhibits considerable intensity. As the Times (op. cit.) reviewer declared, this work ‘clarifies the composer’s powers as a melodist…’ The quartet is written in three movements, two slow-ish outer movements with a central scherzo. The opening ‘inquieto allegro’ is propelled by a vigorous subject but also encompassing much reflective material. Francis Routh (1972) notes that ‘the development section is unusual in that an independent subject appears as a fugue…and combines later with the material of the exposition.’ The sprightly Scherzo is a kind of ‘ghostly dance.’ The final movement is impressive: this is an adagio that builds up to a penetrating climax, and includes references to the opening movement. The Quartet closes quietly. Although presented at the end of piece, this is the heart of the work. The liner notes point out that this quartet ‘remains within friendly distance of tonal reference, with an agenda that pits E flat against F sharp.’ The work is defined by its craftsmanship: formally, the ‘technical fluency’ of the instrumentation and the exposition of the musical material. It was first recorded in 1963 by the Amadeus Quartet and was issued on the Argo label (ZRG5372 & RG5372). It was coupled with Benjamin Britten’s String Quartet No. 2. I have not heard this recording. It was to be more than 23 years before Fricker turned to this genre again. By this time, he was living and working in California. Fricker came to believe that the medium of the string quartet was dead. The appearance of the American composer Elliot Carter’s masterly String Quartet No.3 (1971) changed his view. Fricker’s own Quartet No.3 is dedicated to the American. The liner notes are keen to point out this present work is not an ‘emulation’ or ‘pastiche’ of Carter, but develops Fricker’s own brand of ‘serial strategies.’ The work is in five movements of various lengths. The core of the work is the central ‘adagio.’ This is ‘flanked’ by two fast movements, which themselves are ‘flanked’ by two considerable ‘prestos.’ The finale is a set of eight variations with an impulsive coda bringing the quartet to an exciting conclusion. The work remained unplayed until the 1984 Cheltenham Festival, when it was premiered by the Chilingirian Quartet on 19th July. 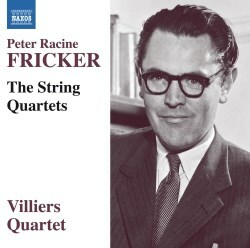 The Villiers Quartet gives a superb performance of all these works: Fricker could not have wished for a better advocate of his corpus of String Quartets. The liner notes are first-rate, and provide sufficient information for an informed appreciation of this music. During the early 1950s Fricker was regarded by many critics and listeners as something of an enfant terrible. On the other hand, he was deemed to be one of the most important rising stars of his generation. Other names at that time included Humphrey Searle, Elisabeth Lutyens and Iain Hamilton. All these composers have (sadly) slipped below the horizon, having been caught between the conservatism of Vaughan Williams and the avant-garde which developed in the nineteen fifties and included Peter Maxwell Davies, Harrison Birtwistle and Alexander Goehr. In Fricker’s case his removal to California did not help him with the promotion of his music in the United Kingdom. In recent years, some steps have been made towards reappraising Fricker’s (and the others’) music, but it seems that there is a long way to go before their names are (re)established in the canons of British Music. The present disc, as well as the recent Lyrita edition noted above, is a positive start in that rehabilitation.